One of my favorites submitted by samanthar on June 17, 2015, 10:57pm Love love love this book. In the beginning I found the pace clunky and hard to get into. I'm not a fan of short stories. After the second chapter/story, I began to get into the book a lot. Once I was used to the writing style, I completely fell in love. The characters and their world is unlike any I've read about before. I can't wait to read more of David Mitchell's work. Takes a little effort submitted by keebs23 on July 28, 2015, 9:23pm Your persistence is rewarded with a cohesive story of human connection. Connected Stories of Connection submitted by Meginator on August 1, 2017, 7:37pm Cloud Atlas is a very ambitious collection of connected short stories exploring, well, human connection through storytelling, and it largely succeeds. The book is comprised of several nested short stories in various genres, each containing the preceding story as an item within it; in this way, Mitchell is able to tell stories about storytelling while exploring what that means and how we have used and might in the future use various narrative forms. He aptly juggles genres as diverse as a ship's log, a mystery, and futuristic science fiction, and each story feeds relatively gracefully into the next. It can be somewhat difficult to resume the narrative threads where they leave off (I often flipped back to the most recent paragraphs during the second half of the book), but each story stands alone and as part of a whole. 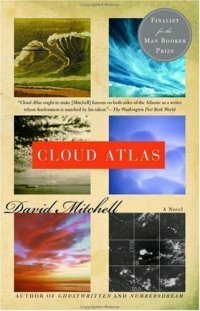 Cloud Atlas is very well done and I suspect that it will reward multiple re-readings as readers discover more connections. Fun and Adventure for the Mature Reader submitted by amandaberry on August 26, 2017, 12:44pm This is an incredible novel, not for the faint of heart. Unforgettable characters and riveting stories woven together into a stunning narrative. David Mitchell's writing will entrance you as he plays with narrative structure, dialect and genre. New York : Random House Trade Paperbacks, 2004.